Like every year the Swiss broadcaster SRF (RTS, RSI and RTR) arranged a national final called “Die Entscheidungsshow” with six finalists in Zurich with the host Sven Epiney. This year there has been a slight change in the decision modus. The six candidates have just been singing their song and now cover song anymore. There was 100% televoting to determine the Swiss entry for Kiev. The winning song “Apollo” was sung by the group Timebelle and received 47.88% of the votes, with a lead of 30%. The band Timebelle originally used to be a boy band, the lead singer Miruna Mănescu joined later. Now the band consists of three members, they met at the University of Bern. The name of the band is derived from the medieval clock tower in Bern, which is the landmark of the city called “Zytglogge”. The band has already tried to become the Swiss representative in 2015 with the song “Singing About Love” and came second. The band is a truly multicultural band with different origins. The singer Miruna comes from Romania, but lives in Bern, she is a trained musician and actress, born in 1995. The drummer Samuel Forster is a Swiss citizen, born in 1996 and Emanuel Daniel Andriescu, born in 1995 plays the saxophone, clarinet and piano. Emanuel is also from Romania and has been living in Switzerland for the past 11 years. They have released four singles already. 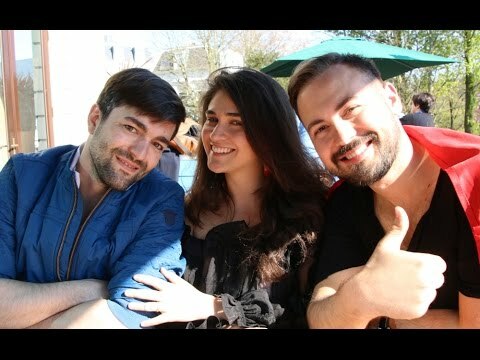 The Swedish composer team have already written a song “Start A Fire” for Dilara Kazimova which made the 22nd place in the Grand Final in Copenhagen. The song title “Apollo” is a homage to the antique God of Apollo who stands for music and poetry. The meaning of the lyrics should motivate to trust into yourself. The song has been revamped and made more modern to the original version. Due to the fact that Switzerland did not pass the Semi Finals for the last two years, there are high expectations that this could be changed this year in Kiev. The R’n’B song has a modern sound with a solid melody, quite radio friendly, too. But it needs a lot of effort to bring this entry to shine on stage to push it to the Grand Final, otherwise it might be overseen. This year Switzerland is taking part for the 59th time in the Eurovision Song Contest. Switzerland is not only one of the founding members of this event it has even won the first contest in history with “Refrain” by Lys Assia in the first year back in 1956. Switzerland has missed out two years 1999 and 2001 due to bad placing in previous years, when the rules were a little bit different and country had to wait a year to re-enter. Since the Semi Finals have been introduced in 2004, Swiss entries were struggling with the qualification for the Grand Final. Only four times Switzerland has passed the qualification round since 2004. Out of 58 participations, Switzerland could only be in the Grand Final for 49 times. And 27 times Switzerland reached the Top10, so there is a statistically chance of 47% reaching the Top10 and 31% to reach the Grand Final since 2004. The Swiss entries have mostly been sung in French and German language, very seldom in Italian or Romansch. In the last two years, Switzerland could not make it into the Grand Finals. It seems that the enthusiasm in Switzerland is not as high as in other countries and in the national finals there is not much to choose from. Probably the most prominent name next to ABBA is Céline Dion, she has been representing Switzerland. The Franco-Canadian singer has won the Eurovision Song Contest in 1988 with “Ne Partez Pas Sans Moi” with only one point ahead to the UK. At that time Céline was an absolute newcomer and she started a world career one year after, when she opened the 1989 ESC in Lausanne with “Where Does My Heart Beat Now”. Nowadays she has her own show in Las Vegas, sells millions of albums and is one of the biggest stars in the world. She is often being taken as role model for young singers.